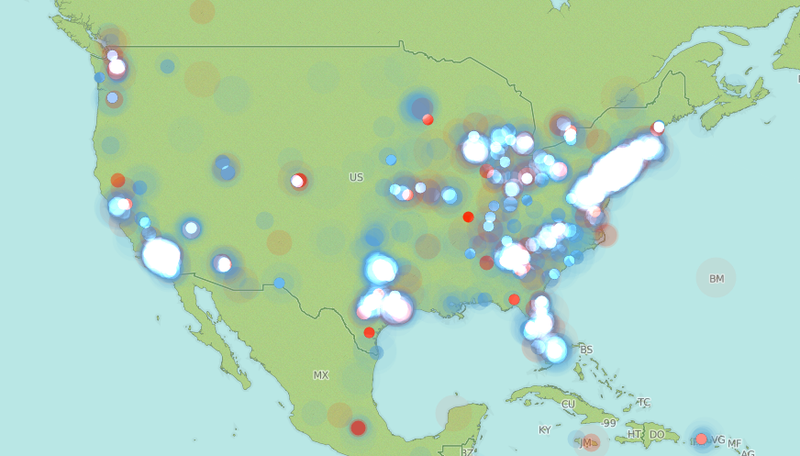 Over at CartoDB, Twitter has created a rolling heat map for yesterday's World Cup match, highlight USA- and Ghana-centric geotagged tweets over the nailbiting 90 minutes. It's interesting to see what cities provided the most chatter; it's fun to see America go up in flames after goals. On the map (which can be panned and zoomed to satisfy your particularly curiosities), red indicates Ghana tweets; blue is the U.S. Here's a Vine showing the domestic tweetstorms for, in quick succession, Ghana's equalizer, John Brooks's winner, and the end of the match.